We were a small and mobile operation. We shot often on the sly. We walked into the St. Luke's Hospital emergency room on 116th street in Harlem with the Bolex running, and grabbed our shot. 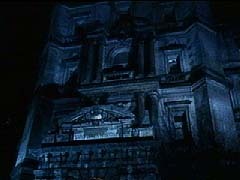 The exterior of that building is beautiful, lit up that night by a film crew across the street. Sometimes we shot two neighborhoods the same night. Our heaviest day we did interiors on 138th Street and Convent Avenue at the City College there, then raced downtown to 103rd do the scene in Central Park with the wolves.